Second Daughter and I took a shopping trip down to Albany to stock up on pantry provisions and went to the Asian Supermarket at 1245 Central Avenue. This stop proved to be yet another fabulous ethnic market to add to our list of great places to find interesting, exotic and naturally gluten-free foods. Asian Supermarket had an extensive produce department, where we found everything from banana blossoms to huge piles of durian to dragon fruit. I didn't buy those three intriguing edibles, but I did buy a huge bag of baby bok choy, packets of chrysanthemum tea, a 20 lb. bag of basmati rice and a wonderful Chinese vegetable from the mustard family, yu choy, which was meltingly soft when braised with garlic and soy sauce. Some other new items fell into our cart. I fell in love with Thai packages of Crispy Fried Seaweed in regular and Tomato Ketchup flavors (gotta try the Kimchi and Squid flavors next time! ), while the young 'un enjoyed scoring a huge bag of Happy (rice) Crackers and some delicious to-go foods from the take-out bar. Some sensuously-curved, light purple Chinese eggplants called to me and I brought them home to play around with. 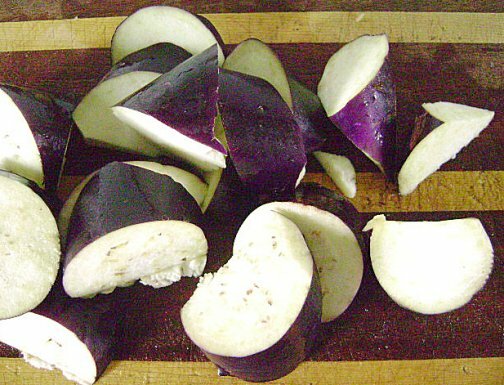 I have never cooked with any eggplant other than the glossy purple-black aubergines of the Mediterranean variety, but I had read that the slender Chinese and Japanese varieties are less bitter and more tender, which I found to be slightly true. Certainly more experimentation with these gorgeous members of the nightshade family are in order here at Crispy Cook Central. My first step was to pore through my well-loved copy of the late Barbara Tropp's "China Moon Cookbook" (NY: Workman Press, 1992). Tropp's blend of traditional Chinese cooking techniques and ingredients, Yiddish-spiced instructions and California pizzazz always wows me, and I love her clear instructions that break down restaurant cooking results into components that a home cook can understand. Tropp offered a few recipes for wonderful eggplant-centric dishes (I've made her Strange Flavor Eggplant several times to rave reviews), but her siren song description of "Dry-Fried Chinese Eggplant Nuggets" as her favorite Chinese eggplant dish, bar none, made my decision for me. The dish involves a roll-cutting technique which I had never tried. It's easy to do but hard to describe. Basically, you make one 45 degree slice at one end of your vegetable and then roll it 180 degrees and make another 45 degree slice at your desired thickness. You end up with chunky, somewhat triangular segments of eggplant, which have a lot of surface area to absorb cooking heat and sauciness, not to mention a whole bunch of visual style. Ming Tsai has a short video segment on roll-cutting carrots and zucchini here which I found helpful before I attempted hacking away at my beautiful lavender-colored eggplants. Aren't those eggplant slices beautiful? They lose their gorgeous purple color when they are cooked up, but the resulting mixture of spicy and sweet flavors surrounding these soft hunks of eggplant tantalize the other senses quite nicely. adapted from Barbara Tropp's "Dry-Fried Chinese Eggplant Nuggets" in her China Moon Cookbook. Slice top and tail off your eggplants and then roll cut them into one inch pieces. Mix together chili paste, soy sauce, palm sugar, black rice vinegar and hot water and stir until sugar dissolves. Heat 3 Tbsp. peanut oil in hot wok or large, heavy frying pan over medium-high heat. Add minced ginger, garlic and most of the sliced scallions (reserving some to garnish the dish). Cook 1 minute, stirring constantly. Add eggplant chunks and cook, stirring frequently, until browned on all sides. Add another Tbsp. of peanut oil if the pan gets dry, but no more, because eggplant is like a big sponge when it comes to absorbing cooking oil. Stir in chili paste sauce mixture and let mixture come to a boil. Lower heat, cover and braise until liquid has mostly been absorbed and eggplant is soft, about 3-5 minutes. Garnish with reserved sliced scallions. Makes 4 main dish servings. We enjoyed it over hot steamed basmati rice. Delectable! 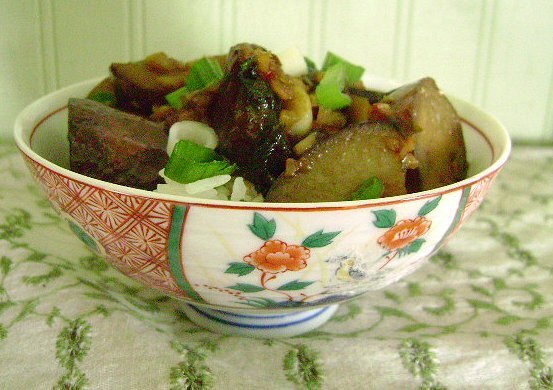 I am sending this dish using my new found favorite vegetable, the Chinese Eggplant, to Weekend Herb Blogging which is hosted this week by Honest Vanilla. Weekend Herb Blogging is housed over at Cook Almost Anything by awesome food blogger and photographer, Haalo, and you'll find four years of weekly recaps, rules for WHB, and other great recipes and blog posts at this wonderful site. The eggplant sounds amazing! Don't you just love finding new food items!? I love to roll cut my carrots, Rachel. The eggplant looks amazing and I'm drooling thinking about baby bok choy. Have only ever had the regular bok choy so I'm guessing it's sweeter and more tender. Yum. You didn't miss anything with the dragon fruit - so pretty but no real flavour. This eggplant, on the other hand, looks AMAZING. I have to try this! I had never seen this way of cutting vegetables. I love eggplant, so I would be happy to get some from the lovely bowl in the photo. I love your long eggplants, I think I will grow them next year!